The ability of NMDA receptor antagonists to inhibit different forms of opiate-induced neural and behavioral plasticity suggests that there may be widespread interactions between NMDA receptors and opioid receptors in the body and that these interactions may be critical in the development of opiate tolerance, sensitization, and physical dependence. Because the majority of evidence in this area has been obtained from behavioral studies, it is unclear whether NMDA receptors and |-opioids located together on individual cells are responsible for the interactions, or if the interactions may be the result of more distributed circuits. However, increasing evidence suggests that NMDA receptors and ^opioid receptors may indeed interact at the level of single cells—anatomical studies suggest that NMDA receptors and |-opioid receptors are colocalized on neurons in the central nervous system (CNS) (128-130), biochemical studies suggest intracellular pathways through which these receptors may interact (131-133), and physiological evidence demonstrates that cellular interactions between these receptors occur within the brain (134,135). Therefore, there is reason to believe that cellular interactions between |i receptors and NMDA receptors may be involved in at least some of these forms of opiate-induced neural and behavioral plasticity. Cellular models for such interactions have previously been proposed for opiate tolerance and dependence (72,93,136-139). The present model, based in part on these previous models, illustrates intracellular pathways by which NMDA receptors and ^-opioids may interact to produce opiate-induced changes in the brain and behavior. The model is depicted in Figure 2. The cascade is initiated by stimulation of |i receptors, which causes activation of protein kinase C (PKC). PKC has the ability to phosphorylate NMDA receptors and relieve the magnesium (Mg2+) block that keeps these receptors quiescent under normal physiological conditions. Relief of the magnesium block (likely together with activation of NMDA receptors by tonic synaptic levels of glutamate) leads to influx of calcium, which can activate several different calcium-dependent processes that may be involved in altering the cellular response to morphine. The first of these is activation of PKC. 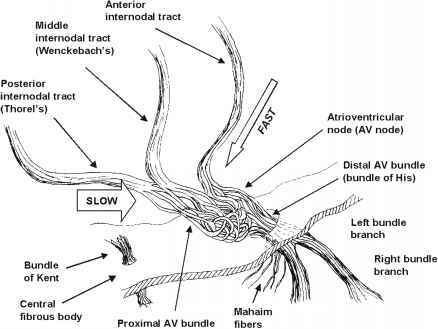 This may represent further activation of the original pool of PKC stimulated through || receptor activation, or a second, distinct pool. PKC may phosphorylate |i receptors, receptor-coupled G-proteins, or second-messenger enzymes, thereby modifying the proteins and producing changes in the coupling of | receptors to key second-messenger cascades. In addition to PKC, calcium entering through NMDA receptor ion channels activates nitric oxide synthase (NOS), leading to production of the diffusible messenger nitric oxide. Nitric oxide (NO) can then activate guanylyl cyclase and cyclic GMP (cGMP) within the neuron, which stimulates cGMP-dependent protein kinases, which, in turn, may phosphorylate | receptors or other key molecules in the second-messenger cascade, causing further changes in the coupling of | receptors to second-messenger systems. 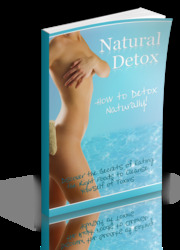 Nitric oxide can also diffuse to the presynaptic cell and activate cGMP within this cell, causing release of glutamate and further activation of NMDA receptors, thereby increasing activation of the postsy-naptic processes that inhibit | receptor function. Another enzyme that may be activated by calcium entering the cell via NMDA receptor ion channels is calcium/calmodulin-dependent protein kinase II (CaMKII). Like PKC and the NO/cGMP pathway, this enzyme may contribute to the changes in coupling of | receptors to critical second-messenger cascades. A functional decoupling of | receptors from second-messenger cascades produced by PKC, NO/cGMP, and CaMKII would help to explain the decreased responsiveness to opiates that is characteristic of tolerance. Fig. 2. Schematic diagram of cellular processes that may mediate interactions between |l-opioid receptors and NMDA receptors in opiate-induced neural and behavioral plasticity + refers to activation, - refers to inhibition, and ** refers to changes in receptor coupling between | receptors and second messengers. The dashed line refers to the general idea that NMDA receptor activation is functionally antagonistic to | receptor function. The solid arrows indicate identified pathways through which NMDA receptors and | receptors may interact. The sequence of events depicted in the model is as follows: | Receptor activation leads to activation of protein kinase C (PKQ), which relieves the magnesium (Mg2+) block on NMDA receptors. Relief of the Mg2+ block leads to the influx of calcium (Ca2+) and activation of at least three different calcium-dependent intracellular cascades: (1) PKC2 (either greater activation of the initial PKC pool, or a distinct pool); (2) nitric oxide synthase (NOS), which leads to production of nitric oxide (NO) and activation of cyclic GMP (cGMP); and (3) calcium/calmodulin-dependent protein kinase II (CaMKII). Each of these cascades may produce changes in coupling between the | receptor and its second-messenger systems (**), leading to the manifestations of tolerance, sensitization, and physical dependence. In addition, NO activation of presynaptic cGMP may lead to the release of glutamate, which further stimulates the postsynaptic processes that modify coupling between | receptors and second messengers. Some intermediates in the cascades are omitted for clarity. Please see text for further details. 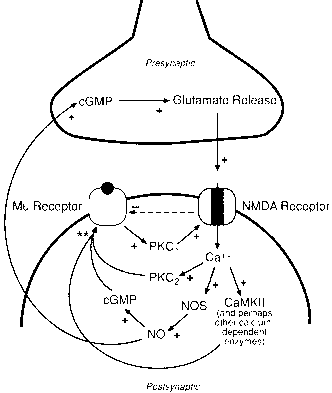 NMDA receptor function by removal of the Mg2+ block on NMDA receptors (131,132,135,151). 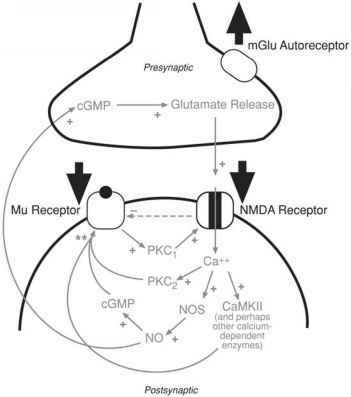 Calcium influx resulting from NMDA receptor stimulation can then activate a variety of intracellular pathways, including PKC, NO/cGMP, and CaMKII. Studies using enzyme inhibitors have been instrumental in demonstrating a role for these pathways in opiate tolerance and dependence— inhibitors of PKC (35,37,140,152-155), PLC (147), NOS (see refs. 2, 71,73, and 156), guanylyl cylase (the intermediate enzyme between NO and cGMP activation) (156), and CaMKII (157), have each been found to inhibit the development of opiate tolerance and/or physical dependence. These enzymes, or others in their respective cascades, may modify | receptors, G-proteins, or second messengers, pro ducing changes in ^ receptor second-messenger coupling. Additional biochemical evidence in support of this model is that PKC, activated through NMDA receptor stimulation, has the ability to interfere with coupling between opioid receptors and G-proteins (133,158-160). The classical view of opioid tolerance and physical dependence has been that these phenomena are mediated, at least in part, by the functional decoupling of opioid receptors from second messengers. Opiates produce primarily inhibitory effects on cellular responsiveness, via G-protein-mediated inhibition of adenylyl cyclase, enhanced potassium efflux, and decreased calcium influx (see refs. 161-163 for review). Decreases in coupling would, therefore, lead to a diminished ability of opiates to inhibit cell function, characteristic of tolerance, and perhaps producing a hyperresponsiveness upon withdrawal, characterisitic of physical dependence. However, more recent studies suggest a more complex and interesting picture—in addition to diminished inhibitory coupling, chronic opioid receptor activation may produce a switch whereby stimulation of opioid receptors produces activation of certain second-messenger cascades (164-169), or an alternative switch whereby opioid receptors become constitutively active (170,171). A further complexity to interactions between NMDA receptors and ^-opioid receptors is suggested by recent electrophysiological data obtained by Martin and colleagues (134,172). Following chronic treatment with morphine, these investigators observed a functional downregulation of postsynaptic NMDA receptors and a functional upregulation of presynaptic metabotropic glutamate receptors (mGluR) in the nucleus accumbens. In other words, postsynaptic NMDA receptors were less active, and glutamatergic autoreceptors were more active following chronic morphine treatment, leading to an overall NMDA receptor hypofunction (see Fig. 3). This pattern is suggestive of a compensatory response to overactivation of glutamatergic signaling in nucleus accumbens neurons containing NMDA receptors and ^-opioid receptors. Thus, these data are consistent with the above-described model whereby opioid receptor activation leads to NMDA receptor activation and, in a feed-forward process, causes increasingly greater NMDA receptor activation (Fig. 2). Fig. 3. Schematic diagram illustrating compensatory changes in |l-opioid receptors, NMDA receptors, and metabotropic glutamate receptors (mGluRs) following chronic opiate administration. Evidence suggests chronic opiate treatment leads to (1) functional decoupling of |l receptors from key second-messenger systems (large downward arrow), (2) functional downregulation of postsynaptic NMDA receptors (large downward arrow), and (3) functional upregulation of mGlu autoreceptors (large upward arrow). For comparison, the cellular events illustrated in Fig. 2 are shown in light gray. Please see legend for Figure 2 and text for further details. dynamic interactions between NMDA receptors and ^-opioid receptors are important in opiate-induced neural and behavioral plasticity. It needs to be acknowledged that there are many other mechanisms involved in opiate-induced neural and behavioral plasticity that have not been addressed in this model. For example, other intra-cellular pathways, such as adenylyl cyclase/cyclic AMP (AC/cAMP), G-protein receptor kinases (GRKs), and mitogen-activated protein kinases (MAPKs) may be involved, as well as regulation of opioid receptor internalization, sequestration, and biosynthesis (94,163). Considering broader circuit interactions, regulation of opioid peptides and other neurotransmitters and receptors that modulate opiate function may also have a role (3,27,173,174). Finally, learning processes involved in the development of context-dependent plasticity are also likely to be involved (1,3,175). Given the complexity of intracellular, intercellular and circuit processes involved in opiate-induced plasticity, it will be a considerable challenge to place NMDA receptors and NMDA receptor-mediated second-messenger events in context with all of the other mechanisms involved in opiate tolerance, sensitization, and physical dependence (see ref. 93 for further discussion).